1. Can Sloane shake a tag? 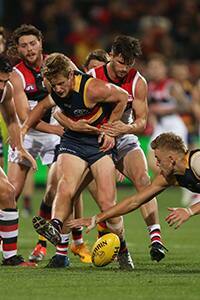 Rory Sloane was blanketed, but Adelaide had an easy win. That was the silver lining for the Crows. When the Brownlow Medal fancy has been stifled by taggers in other matches this year, the Crows have lost. The bad news is Sloane doesn't know how to shake tags and he's had four desperately quiet matches in six weeks. Sloane was widely elevated to the competition's midfield elite earlier this season but unlike the League's other two preeminent midfield stars – Dusty Martin and Patrick Dangerfield – he isn't untaggable. Dangerfield and Martin have the explosiveness to burn any stopper, but Sloane does not. He had just five possessions to half-time on Friday night as Koby Stevens had him in his pocket, although he did manage a goal after a free kick. Don Pyke appeared so lost for answers he even sent Sloane to the back pocket during the second term. He finished with 14 disposals, but five of them came from free kicks. Sloane will need to learn how to overcome tags because he is certain to be targeted every week for the rest of the eason. 2. Another easy win for Crows at home – big deal? Adelaide coach Don Pyke and his troops can only beat whoever is on the fixture but unfortunately they'll have to deal with this style of reaction until they pass a major physical test. The Crows again showed us what they can do when they have the match on their terms on Friday night. They owned St Kilda on the inside and their silk allowed plenty of moments to shine on the outside. The Crows won't silence their doubters until they win a contest where they are challenged physically and forced to call on plan 'B'. They haven't been able to do that in their three losses in 2017. But this may not just have been another soft kill. Adelaide played hard-nosed, defensive football, especially for three quarters and robbed the Saints any opportunity to play on their terms. Four weeks ago, St Kilda beat GSW into submission with a relentless combination of pressure and hard running. Some were hailing the 5-3 Saints as genuine top-four contenders. Three straight losses later the Saints might have to win eight of their last 12 to make the eight – a prospect which looks seriously unlikely. What's changed other than personnel issues? Attack at the contest. During their run of three straight wins from rounds six to eight, the Saints were No.1 in the League for contested possession differential at +64. The Saints have lost the contested ball in their last three matches and it has directly correlated with scoreboard results. The Saints have also lost big when they've gone down this season. Competitive efforts against West Coast and Geelong aside, the Saints have yielded too easily with five of their six losses by 30 points or more. Jake Lever has given every indication he intends to remain at Adelaide next season and he will likely be playing for considerably more money. Holding off contract talks can go one of two ways and Lever's sensational form means it has gone in exactly the direction he had hoped. The half-back is quickly becoming one of the Crows' linchpins in defence and his form against Geelong and again against the Saints have been something to behold. Lever's ability to read the ball in the air across half-back and mark or impact the contest has become a weapon for Adelaide and the source of many attacking forays. He had 14 disposals and four marks to half-time and was among the best on the ground to that point. 5. No Riewoldt, no Saints? St Kilda coach Alan Richardson has changed Nick Riewoldt's role in attempt to make his side less reliant on their ageing champion, but the Saints remain lost without him. Friday's demoralising loss to Adelaide was the Saints' eighth in their last nine appearances in the absence of Riewoldt. When Riewoldt has played in 2017, the Saints are 5-3 and they will be banking on him returning next Friday night against North Melbourne. But the 34-year-old won't play forever. St Kilda is considered a rising side but it must find a forward formula which works without its champion. Josh Bruce made a positive return on Friday and was the Saints' only goalkicker to three-quarter time. but Paddy McCartin's influence was negligible and he is yet to prove he can consistently play the level, let alone lead the Saints into the post-Riewoldt era.